It’s Monday. Another cold and frosty morning, when all I want to do is to curl up in bed and wish the week would hurry up to Friday. Since I have a case of the Monday-blahs, I’m jumping right to the point today in hopes to lift my spirits. I’ve got cake for you. And not just any cake, but this No-Bake Mint Oreo Cheesecake. This decadent dessert features a cookie crust, filled with a rich and creamy mint cheesecake batter. And did I mention that it’s no-bake? 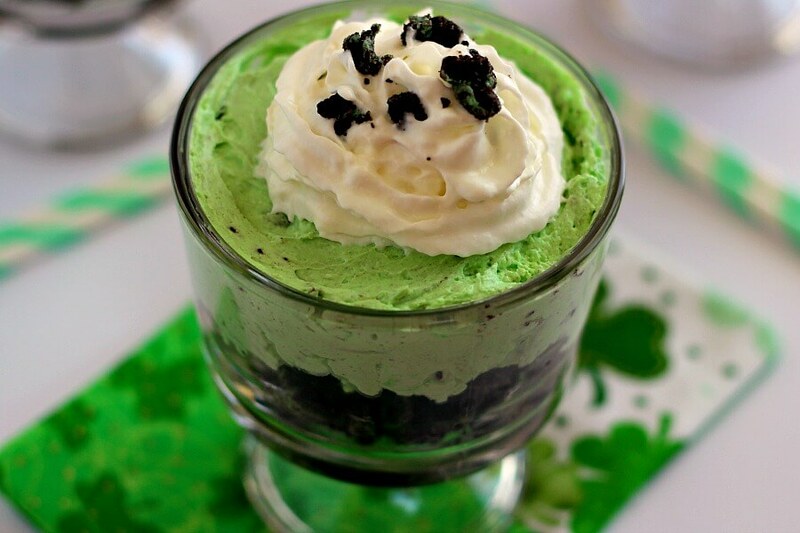 Since St. Patrick’s Day is less than two weeks away, I thought I would share my favorite green dessert with you! And it just so happens that cheesecakes are the perfect treat for Mondays, too. Agree? Even though I’m not Irish, I do like baking (and eating) green and minty desserts around this time. And while those shamrock shakes are delish, I decided to go the more cake-y route. After all, who can resist cheesecake, especially mini ones that require no oven? Speaking of St. Patrick’s Day, are you one to celebrate? Occasionally I will make a corned beef in my slow cooker or the hubster and I will go out for a green beer. In Chicago, they dye the river green every year and it’s so fun to see! I’ve never been there in person to see the dye added in (kinda sad since I don’t live too far from the city) but I love seeing it featured on TV. But this year, the hubster and I will probably stay in and indulge on this No-Bake Mint Oreo Cheesecake. It has the perfect combination of mint and chocolate, combined with a smooth and creamy filling. And because it takes just minutes to whip up, I will spend less time in the kitchen and more time on my couch eating these cuties. Sounds pretty good, huh? The crust for this No-Bake Mint Oreo Cheesecake is made out of mint oreos and butter. Simply crush them using a food processor or rolling pin and then mix with some melted butter. Spread it on the bottom of several glasses or mini triffles, and pop ‘em in the fridge to firm up. Next comes the fun part, making the filling! Cream together the cream cheese and cool whip, and then add in a good dose of green food coloring and crushed cookies. Spoon this on top of the prepared crusts and get ready to be wowed. This No-Bake Mint Oreo Cheesecake is the perfect treat to celebrate St. Patrick’s Day with, or just when you want to indulge and forget that it’s Monday! P.S. Don’t forget to enter this amazing $400 Amazon Gift Card Giveaway! This decadent No-Bake Mint Oreo Cheesecake features a cookie crust, filled with a rich and creamy mint cheesecake batter. In a food processor, blend Oreo cookies into fine crumbs. Alternatively, you can add cookies to a large ziplock bag and crush with a rolling pin. Place cookies into a medium bowl and add melted butter. Stir to combine. Spread cookie mixture evenly on bottom of 4 small glasses or mini trifles. Refrigerate while preparing rest of dessert. In a large bowl, whip cream cheese and vanilla extract using a stand mixer with a fitted paddle attachment or hand mixer. Gently fold in Cool Whip, Oreo cookies, and food coloring. Gayle! You really are my blog soul sister. I posted St. Patrick's stuff today, too! I love it when we're in sync like this. 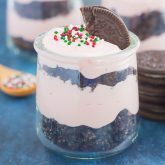 :) And this looks amazing .Cheesecake is always a yes, especially in a cute little jar! Great minds think alike, Mir! :) Thanks so much for the kind words, friend! Thanks, Christin! I love finding a reason to buy oreos, too! I want to eat this through the screen! This reminds me of a chocolate bar we have here called an Aero. It's delicious minty chocolate. Yum! Thanks, Dannii! That Aero bar sounds delicious! Oh my! You had me at that first picture! This is a perfect treat for St. Patrick's Day, Gayle! This is a keeper! Thanks, Annie! I love the pretty green color and mint flavor, so festive! These are too cute for St. Patrick's Day! What a fun dessert! Yes, Gayle! These looks amazing. Chobani now makes a mint chocolate chip greek yogurt and I savor it! Although I'm half Irish, I'm not a huge Corned Beef fan. I'll eat Irish Soda Bread, but that's about the extent of my celebration. Now, I know what I'll be making for dessert though! Oh I will be on the lookout for the mint chocolate chip yogurt, Erin! And I hope you love this dessert if you try it! So THIS is what my Monday morning is missing. Haha! Seriously though, these cheesecakes look absolutely fabulous Gayle! Mint + Oreo + Cheesecake = Life. Drooling over these! Haha cheesecake for breakfast is always delish, right? :) Thanks so much for the kind words, Sarah! Thank you, Keri! This year is flying by too fast already! These look so pretty and festive for St. Patty's day, Gayle! I LOVE the green colour it is absolutely gorgeous! I know what you mean - the Monday blues are real!! <3 Hope your week is off to a wonderful start! Pinned!! Thanks so much for the cheesecake love and pin, Ceara! Happy Monday Gayle! It feels like this cheesecake is going to turn into my favorite green dessert ! Looks delicious! Will definitely try it!!! Happy Monday to you too, Mira! This cheesecake is my favorite, just the right about of minty-ness! So lite, and delicious looking dessert, Gayle! I'm sure it will be perfect for St. Patrick's Day! Thanks, Savita! It's definitely perfect for the upcoming holiday! No bake = no problem. And yesss, I wish it were Friday already. Oh well, another week, another kitchen full of baked goods... Am I right? I LOVE mint chocolate chip, and this dessert looks so delicious and fun! 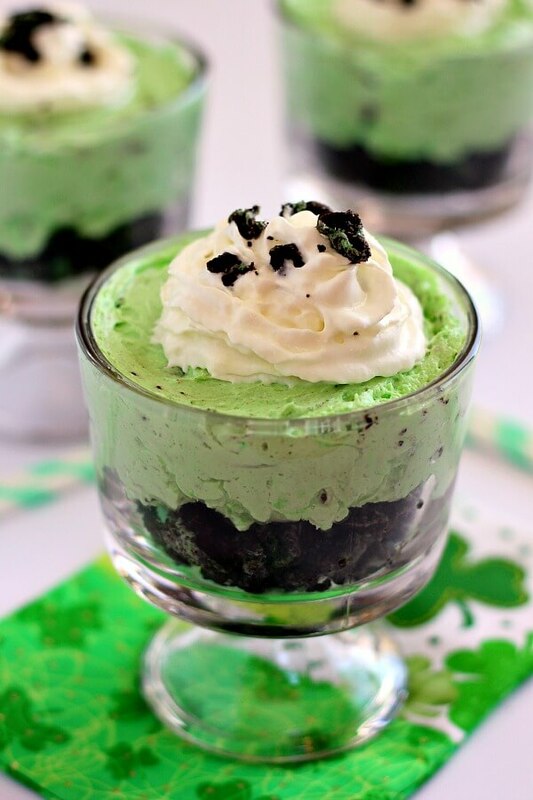 I love what you did with these minty Oreos, and this would be the perfect St. Patrick's Day dessert! Pinned. Thanks for the kind words and pin, Marcie! The mint oreos are perfect in this cheesecake. Gives it just the right amount of flavor! 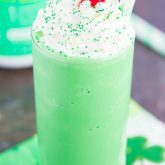 This is such a fun and tasty St Patty's Day treat, Gayle! I am all about a no bake dessert. And mint oreos are some of the best! No-bake desserts are definitely the best! Thanks, Jen! Great minds think alike, Medha! :) Can't wait to see your recipe! This cheesecake looks amazing! I love the mint Oreo flavour and that colour is so vibrant! :D Love that it's no bake too! What a fun treat for St. Patrick's Day Gayle! Love! Pinned. 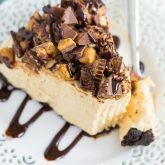 Love this cheesecake, and I adore that it's no bake! The color is perfect for St. Patty's Day :) pinned! Thanks, Rachel! I love the green color, too! Yes! This cheesecake definitely has me feeling just a little bit happier today! :) I hope you feel better, Alice! And I would totally send you some if I could! Mint oreos are the best! Not too minty, which is just the why I like them! Thanks for the kind words, friend! This is totally calling my name! I simply adore mint and chocolate together! 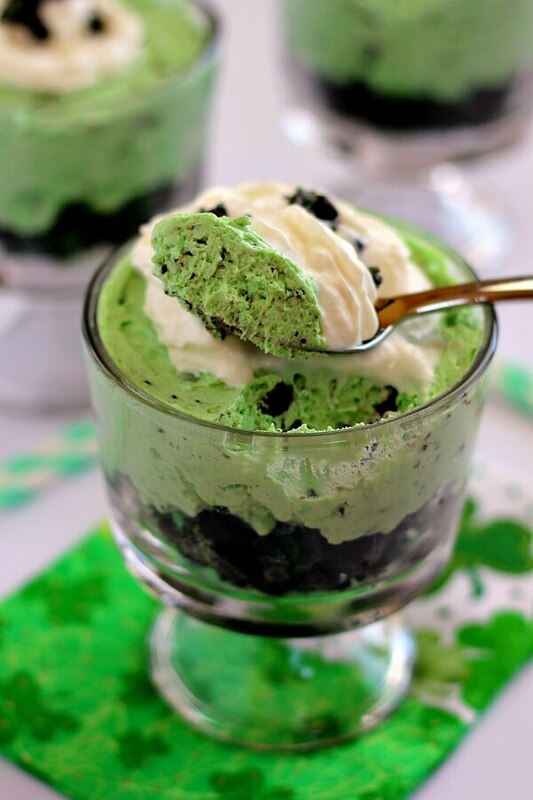 This is such a festive treat for St. Patrick's Day! Mint and chocolate definitely make the best combo, Annie! Thanks! omgoodness this looks so ridiculously delicious! I must make this for St Paddy's! This is delicious, Beverley! Thanks so much for the kind words and for stopping by! Thanks, Helen! It's not quite ice cream, but cold and creamy sure does the trick! 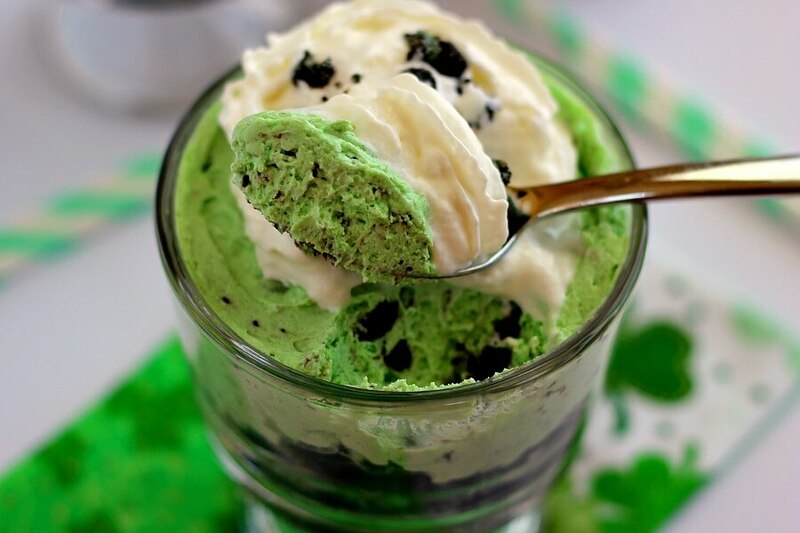 This is the ultimate St. Patty's day treat! Thanks, Christina! These are PERFECT!! Oh my gosh. The best ever. Pinned! Cheesecake....making the same mistake twice is just my monday thing! SMH! I used to live in the city and I never saw them dye the river! My husband and I were usually working. :( Now they dye it on the weekend before St. Patrick's Day and I have made a promise to myself to go this year. We'll see what the weather is like first though. ;) This looks incredible! So easy, yet it looks like you spent a ton of time on it. This is a must try. Pinned! Yes! Getting the weather to cooperate is the worst part! :) Thanks so much for the kind words and pin, Linda! Thanks, Justine! I'm totally addicted to this cheesecake! Haha, I'm not Irish either but I could always go for some green cheesecake like this! Oreos and mint seem to go so well together! I don't mind Mondays much because my work week starts on Tuesday, but today it is cold and rainy and I've just been sitting inside all day watching The Pioneer Woman re-runs! The Pioneer Woman is my favorite! I could definitely watch her all day too, especially on rainy days! Thanks for the kind words, Izzy! Mondays are the worst! However, this amazing cheesecake I'm pretty sure could change all of my ill-feelings towards Mondays forever! It looks incredible! Mint chip anything is fantastic! No bake makes this PERFECT!!! I totally agree, Senika! Thanks for the kind words and for stopping by! Oh wow, this looks fantastic! The mint is wonderful and you make it so delightfully easy to put together! I can't wait to try this! Thanks, Shelby! It's such an easy no-bake treat! No bake desserts are the best! This is perfect for St Patrick's Day! I have suchhhh a case of the monday blahssss! haha It's so bad! And I still can't shake it and it's almost 9pm! But these cheesecakes look sooo good. And so festive! At least it's almost Tuesday! Thanks, Ashley! Gayle, I'm trying to be good, but crushed Oreo cookies? Did you know that I go to get frozen yogurt, get a little bit of sugar-free whatever, and pile up the cup with crushed Oreos?? *sigh* I'll make this one this weekend. Oreos and frozen yogurt sound delicious, Eva! These are perfect for Mondays! Or just any day. Cheesecake is my favorite! WHOA!!! Gayle, wow. I am speechless. What an awesome recipe. Pinned!!!! Thanks so much, Kathy! I had a blast making (and eating) this dessert! These cheesecakes look incredible! Loving the St. Patty's spirit everywhere! These look so amazing, Gayle! I love oreos and anything mint chocolate, so these sound perfect. I love that they're no bake too, my favorite kind of dessert. Pinned! Mint and chocolate is definitely the perfect combo! Thanks for the pin, Danielle! No bake desserts are the best Gayle!! This looks so delicious! That looks amazing Gayle! Mint and oreo are two of my favourite things, and no bake cheesecake just makes it even better! Love this! No-bake cheesecakes are the best! Thanks, Stacey! This looks amazing, Gayle! I seriously just want to dive right in head first! I love that it's no bake! What a perfect treat for St. Patrick's Day! We're mint oreo twins, Renee! :) Thanks! No bake cheesecake! You are awesome! This looks amazing!! We don't normally celebrate St. Pattys day either, but I'm gonna need to make these for my hubby. He would love them. PS I need to come to Chicago and see the green lake. How fun. Its dry desert land out where I live. ;) Pinned! The green river is pretty neat to see! And no-bake cheesecakes are my fave! Thanks, Cyndi! 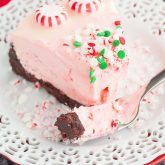 Oh I just adore no-bake desserts! Especially ones like this where it looks like you slaved away in the kitchen all day. Mint + chocolate is my thing, so I'd absolutely love this! What I would give for one of these mint cheesecakes right now! Chocolate and mint is one of my favourite combinations.. and the addition of oreo is just making me drool with envy here Gayle. Thanks, Thalia! This is my new favorite dessert! This looks wonderful Gayle! Love that this cheesecake is no bake!! Such a pretty dessert. I love that they die the river green! St Patty's was such a big deal in Boston... I miss it! Not so much here. But I'll definitely be cooking a corned beef and celebrating some green sweets! These cheesecakes look so yummy! I love mint oreos! Corned beef sounds like the perfect meal, Jess! And thanks so much for the kind words! I'm thinking my diet needs more greens in it. I'll start with this Mint Oreo Cheesecake please!! YUM!!!! This mint oreo cheesecake sounds amazing! I love no-bake desserts (especially cheesecake!). Nice photos too! Oh, I saw your recent posts on your sidebar, and they looks SO nice! What plug-in do you use for them? And where do you get the tastespotting badge? I have a tastespotting account, but I can't find the badges. Thanks for the kind words and for stopping by, Mandie! I just googled tastespotting badge and there are ones you can download, as tastespotting doesn't offer official ones.